A Magpie is a unique creature, it loves bright, sparkly things! That's me, I love color, pazazz, glitter, silver, gold and frankly I have never met a gem stone that I don't like! Jewelry is my thing. I plan my outfits around what jewelry I want to wear, instead of accenting my clothing...that's boring! When I go to the mall I can't escape the draw of the glitterati of a fancy highend jewelry store. When I shop WOW, it's nearly impossible for me to escape the jewelry boards and a quick perusal of the jewelry in the cases. I have a new confession...just yesterday as we were photographing jewelry for a new commercial, I decided I wanted to try and take some of the photos. So, we unlocked the Anita Goudeau cases and I held out my hand and BAM, I fell in love. 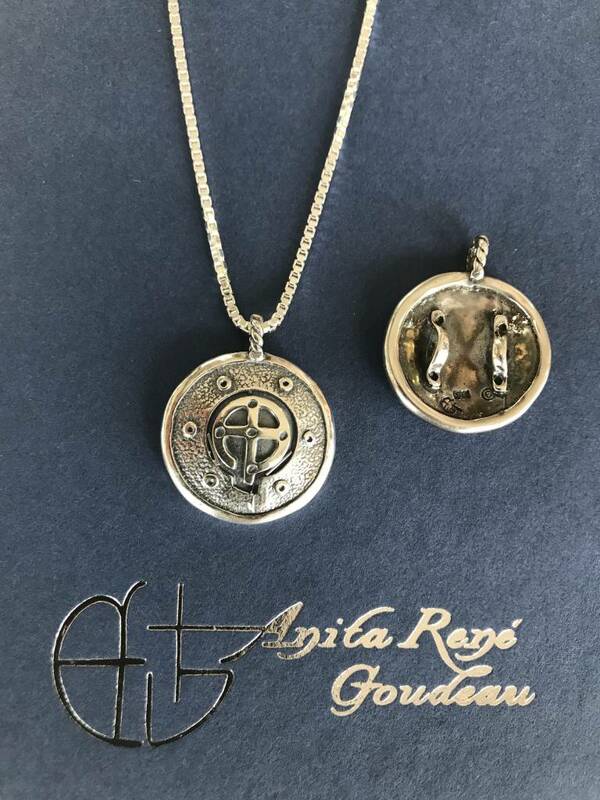 Looking in the case is nothing like holding these amazing pieces in my hand, turning it over and seeing the intricate personal details engraved into the pieces, the references, the crosses, the hearts ON THE BACKS. I was and am in awe. Anita Goudeau is not a just a jewelry maker, a silversmith, she is an extremely creative spirit-filled ARTIST. The piece in the picture is called the ARMOR BEARER, it's a shield, and look at the back, the handles to hold the shield in place. The box chain is weighty and just the right length. This magpie can't wait to own the Armor Bearer, the Cross My Heart, I Love you silver and gold large pendant, and... I want to know what you like? What is your favorite piece of jewelry? What makes you happy? Visit the website and find your very favorite piece! I want to hold that one immediately! They are ALL SO GOOD!! Never knew that about magpies, but it’s an appropriate nickname for you, girlfriend!! The piece of Anita that I like the best is the one that I’m holding at the time!!! I find new details every time I help a customer make their selection. If you forced me to chose, it’d be the alpha and the omega!! It has the scripture reference on the back and that gives me security knowing Jesus is the beginning AND the end!!! !